Continued from last week: A series of posts called Center. I’m writing this for you if «•» the news makes you feel like your sleeves are on fire «•» your life circumstances yank you in 72 directions «•» you are dispersed, distracted and distressed. «•» I’m there, too.These meditations have emerged from about a year of seeking a return to center, the potent silent core where I know who I am and can move effectively in the world. That is: Fire in the belly, not on the sleeves. Thanks for reading. But then the hand came down from the sky and offered them an envelope. Beshamel took it, and the hand disappeared. Do you ever watch the news and feel like you’re reading hate mail? When I say “hate mail,” I don’t just mean partisan screeds and tweet storms, or a rally where a powerful person publicly mocks a suffering person. Even policies and decisions can feel like hate mail, specifically crafted to send a message: You are beside the point. You are using our valuable time and resources. Your concerns aren’t our concerns, and you are not wanted here. I once had a job where I answered hate mail. My first job out of college was at a peace organization, in Washington, DC, in 2002-03—the year that the United States entered the Iraq War. With all my heart, I believed in this work—but I was not a great match for this job. My job was organizing students, but I dreaded protest marches. Conference calls, coalition politics: Ugh. I’m an introvert, and—surprise!—organizing involves a lot of people. When I looked at the student organizers in our peer organizations, I felt unqualified not just in experience, but something deeper, something about me, the fabric of me. We all opposed the war, but they were so fierce and savvy. It usually got uglier from there, but you get the picture. I wasn’t required to answer these emails, but it felt like one small thing I could offer.Even as a kid, I’d always liked writing letters. Sorry. You are a nice person. The moral of this story is not, not, not Stuff your rage and be a “nice person.” I Movements need people who can organize nonviolent, righteously angry, often-noisy protests. But that wasn’t me. felt honest to who I was. So let’s talk about who you are. One of the things I mean by “center” is the naked place behind your public persona, where you are who you genuinely are. 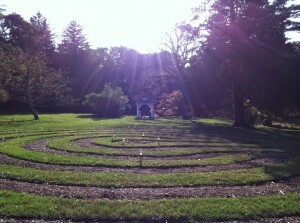 That immovable center of the labyrinth. Returning to that place, again and again, can keep us from being blown apart in a time of crisis. Sometimes that place gets blanketed with litter and snowfall, and we can’t see it anymore. So here’s a question for you—a little shovel to unearth a glimpse. This question might seem trivial at first, so humor me. Take a moment and think about it. 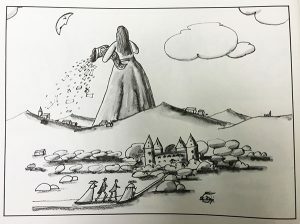 Could be a picture book. The one you read over and over because it felt good to read. Before you learned that books (and clothing, music, lingo…) can be social code, things you can use to broadcast who you are. About a year ago, I had a sudden memory of one of my favorite children’s books. I’d lost the book, and it’s out of print now, so I got my hands on a used copy. 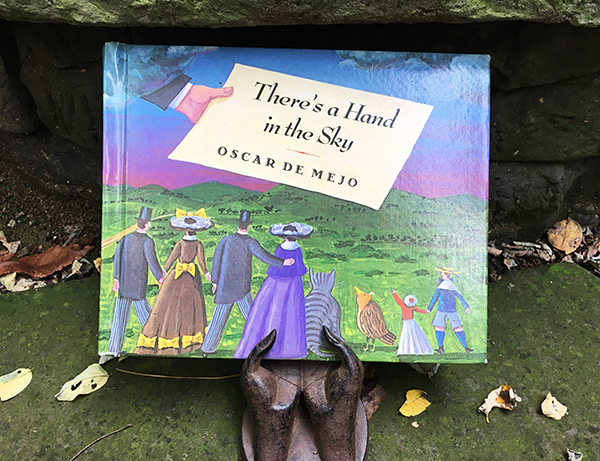 There’s a Hand in the Sky, by Oscar de Mejo. Two neighborhood children, Mic and Beshamel, imagine what it would be like to attend the grand masquerade. 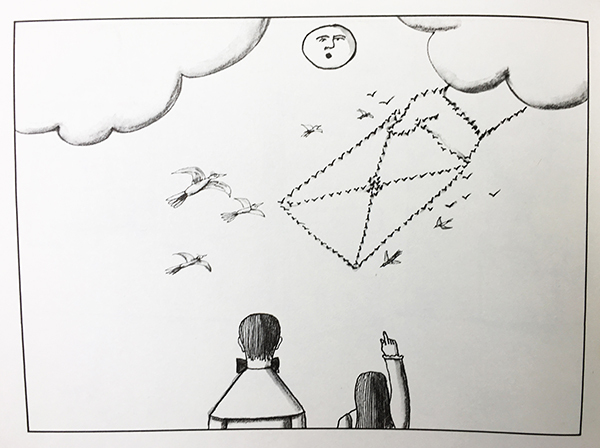 The very next day, a hand appears in the sky, floats down to earth, and offers the children an envelope with a map to a secret passage. They go on a creepy nighttime journey. They get to explore the ball (which is charmingly bizarre). Drawing illustrations for my novel, Electric Inklings. I’d forgotten almost all of this, but I realize now this book had a profound influence on me as a child. The whimsy, the weirdness, the wonder of that ghostly hand. 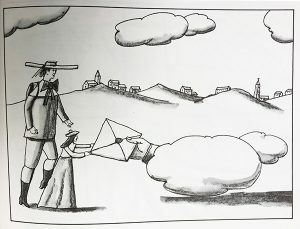 The novel I later wrote as an adult is full of whimsy and weirdness and hands and envelopes. And this idea haunts my work and life: that there’s more in the world than I can see, that I am missing subtle wonders all the time. I’ve been keeping There’s a Hand in the Sky on my windowsill lately. When we talk about practices that center us, often we think of breathing and yoga and all that (and I’ll probably write about those too), but there are other shortcuts to the center. Re-reading this odd little book has become one for me. If you feel deluged with hate mail sometimes—or just plain mail, literal and metaphorical, so many things to be sorted out and answered—I am wishing you an envelope of a different kind. One with a clue. A map. An invitation. 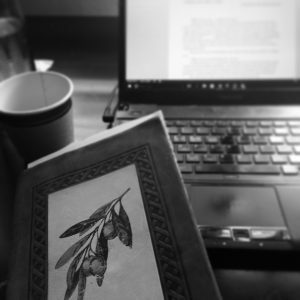 Getting back to that book you loved. I wonder: Could you get a copy of it? I wonder: Might it remind you of something important at your center? Or, if nothing else, give you a moment of returning to yourself before you look for the next right step? 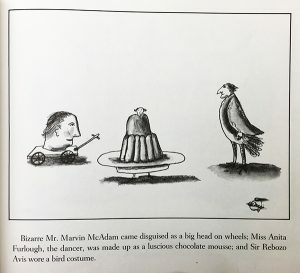 My very first thought was Matilda by Roald Dahl but I wonder if I dig some more in my memories I will think of an earlier picture book. Kathryn, you know it was the 30th anniversary of Matilda this week, right? I LOVED that book too. I read it till the cover was falling apart. Touching Jen. Thank you. One of my “projects” in retirement is reaching the Center, and receiving the Blessing there. You are leading me with words of the heart. Lord, in your mercy, fill Jen’s Center. Love it. I will take that prayer any day, with gratitude. My book (which I kept the original from my parents) is “Only one woof” by James Herriot. It was one of the reasons I wanted to be a vet as a child. Now I appreciate the strangeness of the dog . You still have it?! I would love to read a story about a strange dog! Flip about a horse who dreamed he could jump across a lake and he did. Tried to find it years ago. I’ll try again. And ‘Where the Wild things are’ -he wanted to be home where someone loved him best of all! I still tear up at that line.